A worker at VKE Cargo in Miami prepares a pallet containing cargo to be shipped to Venezuela. Fewer shipping companies are willing and able to ship to Venezuela. For many people in Venezuela suffering from shortages of food and medicine, a lifeline runs from Miami through companies like VKE Cargo. It's a storefront and a small warehouse located in Doral, a Miami suburb. Oscar Saker was there with his sister recently, helping carry several bags of food and supplies they're sending to Venezuela. Among the items were cereal, toilet paper, tomato sauce, rice and pasta. "She's shipping [to] her family," Saker says, "Basics — nothing fancy, nothing expensive, nothing extraordinary." They send the packages every month. But getting food and other supplies to family, he says, has gotten more expensive and more difficult. An estimated 200,000 Venezuelans live in South Florida. For years now, many have been sending packages with food and medicine to family and friends back home. But, as conditions have deteriorated in Venezuela, fewer shippers are sending packages there. In Doral, a city that's adjacent to Miami's airport, there used to be well over a hundred companies sending commercial shipments to Venezuela. It was big business, generating just a few years ago over a billion dollars in revenue annually. Now, just a handful of companies are still in the business. The owner of VKE Cargo, Elisaul Herrera, says most of his business now comes from individuals like the Sakers, sending shipments to family back home — food, medicine, even emergency generators, which he keeps on hand. Customs officials in Venezuela keep a watchful eye on shipments and the shipping companies. When asked if he had difficulties with customs officials in Venezuela, Herrera said, "Yes, that's a problem but you have to work with them, because if not, you have to close." Ernesto Ackerman owns a company that at one time did good business shipping to Venezuela. "We sent lots of medical equipment," Ackerman says, "Also personal belongings, furniture ... even cars. But now? Nothing. Zero." Along with his shipping company, Ackerman also is part of a Venezuelan exile group that has been outspoken in its opposition to the regimes of Hugo Chavez and his successor, Nicolas Maduro. Over the last two years, Ackerman says corruption and bribery in Venezuela has gotten even worse. "Those generals that are in charge of customs, you need to pay them," he says. "Me, myself being anti-Chavez 1000 percent, it's very hard to bring stuff in, very hard." Owners of companies that are still shipping goods to Venezuela say they work to stay non-political. But because South Florida is home to tens of thousands of Venezuelan exiles who fled the repression and harsh economic conditions of the Maduro regime, that's not always possible. Shipper Gilberto Altuve is still sending cargo to Venezuela, but it's a small fraction of what he used to handle. What has changed? "The economy, the Venezuelan economy," he says. Corruption is a problem, he explains, but what's really hurt is Venezuela's economic collapse. Two years ago, there were 14 cargo flights to that country each week. Now, there are just one or two. With the uncertain political situation, everything is on hold. Foreign-owned companies aren't investing there and local businesses are shutting their doors. Altuve cites one of his best customers as an example. She used to have 33 stores in Venezuela. "Suddenly, she only has one," he says. "Then last year, she closed the last one. She's now living in America." Shippers don't like to talk about how they're getting their goods into Venezuela, measures that sometimes involve subterfuge and backdoor payments. Altuve says for him, getting goods into the country isn't a problem. The real challenges come he says when you try to deliver them to recipients in Caracas or other cities. With food and other supplies so scarce, trucks are routinely stopped and looted. "The police stop you, they want to take the merchandise from your car," Altuve says. "Even the firefighters, if they go to your place, if they see someone's cell phone, they see anything they like, they want to take it." Because of the lack of security, Altuve can't insure shipments to Venezuela anymore. He says no company will accept the risk. Despite the difficulties, many Venezuelan business owners in South Florida are feeling upbeat because of the emergence of opposition leader Juan Guaido. He has been recognized by the U.S. and other countries as Venezuela's legitimate president. After years of turmoil, there's hope now that change is coming. For many people in Venezuela, suffering from shortages of food and medicine, a lifeline runs from Miami. Many Venezuelans living in South Florida have been sending care packages to family and friends back home, but getting those packages delivered is getting much harder. Here's NPR's Greg Allen. 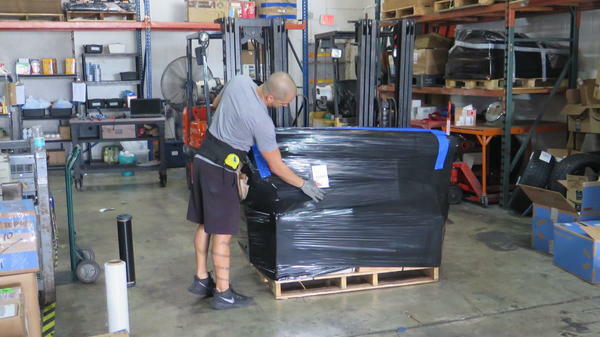 GREG ALLEN, BYLINE: At VKE Cargo in Doral, a Miami suburb, Oscar Saker has arrived with his sister, carrying several bags and boxes they're sending to Venezuela. OSCAR SAKER: She's shipping for her family to feed. ALLEN: So I see cereal, toilet paper, tomato sauce. SAKER: (Laughter) basic. Nothing fancy, nothing expensive, nothing extraordinary. ALLEN: Saker says they send the packages every month, but getting food and other supplies to family, he says, has gotten more expensive and more difficult. The owner of VKE Cargo, Elisaul Herrera, says there are no longer many companies that are sending goods to Venezuela. Most of his business now comes from individuals sending shipments to family back home - food, medicine, even emergency generators, which he keeps on hand. ELISAUL HERRERA: Right now we have one, but we shipped four or five in that pallet. ALLEN: And you have problems with Customs? That's what I'm hearing from other shippers. They say Customs can be difficult. HERRERA: Yes, that's a problem, but you have to work with them because, if not, you have to close. ALLEN: Customs officials in Venezuela keep a watchful eye on shipments and the shipping companies. Ernesto Ackerman owns a company that used to do good business shipping to Venezuela. ERNESTO ACKERMAN: We send lots of medical equipment but also personal belongings, you know, and furniture and stuff like that, even cars. But now - nothing, zero. ALLEN: Along with his shipping company, Ackerman also runs a Venezuelan exile group that has been outspoken in its opposition to the regimes of Hugo Chavez and his successor Nicolas Maduro. Over the last two years, Ackerman says, corruption and bribery in Venezuela has gotten even worse. ACKERMAN: Those generals that are in charge of Customs say you need to pay them and all that. Then me, myself, being anti-Chavez 1,000 percent, it's very hard to bring stuff in. It's very hard. ALLEN: Owners of companies that are shipping goods to Venezuela say they work to stay nonpolitical. But because South Florida is home to tens of thousands of Venezuelan exiles who fled the repression and harsh economic conditions of the Maduro regime, that's not always possible. In Doral, a city that's adjacent to Miami's airport, there used to be well over 100 companies sending commercial shipments to Venezuela. It was big business, generating just a few years ago over a billion dollars in revenue annually. GILBERTO ALTUVE: It used to be a huge business (ph) - not anymore. ALTUVE: The economy. The Venezuelan economy. ALLEN: Shipper Gilberto Altuve says, yes, corruption is a problem, but what's really hurt is Venezuela's economic collapse. Two years ago, there were 14 cargo flights to that country each week; now there are just one or two. With the uncertain political situation, everything is on hold. Foreign-owned companies aren't investing there, and local businesses are shutting their doors. Altuve cites one of his best customers as an example. He says she used to have 33 stores in Venezuela. ALTUVE: Suddenly, she only has one. Then last year, she closed the last one. And she's now living in America. ALLEN: Altuve says, for him, getting goods into the country isn't a problem; the real challenges come, he says, when you try to deliver them to recipients in Caracas or other cities. With food and other supplies so scarce, he says trucks are routinely stopped and looted. ALTUVE: The police, they want to take the merchandise from your car. Even the firefighter, they go to your place, they want to have - they see someone's cellphone, they see anything they like, they want to take it. ALLEN: Despite the difficulties, many Venezuelan business owners in South Florida are feeling upbeat; that's because of the emergence of opposition leader Juan Guaido, who's been recognized by the U.S. and other countries as Venezuela's legitimate president. After years of turmoil, there's hope now that change is coming. Greg Allen, NPR News, Miami. (SOUNDBITE OF CHEQUERBOARD'S "DUNES") Transcript provided by NPR, Copyright NPR.